The Gospel Coalition Council Members don’t agree on all theological issues. When it comes to baptism, for example, some restrict it to professing believers, while others baptize infants. Even in areas where they do agree, like complementarianism, the way theological implications play out in their churches and contexts differs significantly. We must be ready to stand together in cultural co-belligerence, rooted in a common core of philosophical and theological principles, without demanding confessional agreement or pretending that this has been achieved. Co-belligerence, then, is a way of working with others—even those with whom we radically disagree—against a common enemy. It allows otherwise questionable partnerships in order to further a particular social, political, economic, or cultural cause for the common good and human flourishing. If God is sovereign, then his lordship must extend over all of life, and it cannot be restricted to the walls of the church or within the Christian orbit. . . . God’s sovereignty is great and all-dominating in the life of that unbaptized world as well. Therefore, Christ’s church on earth and God’s child in this world cannot simply retreat from this life. In our modern context, justice is one issue on which the church can pursue co-belligerance. Throughout the Scriptures—from Isaiah’s tsedaqah call to Jesus’s inaugural sermon—it’s clear that Christ-followers are to be people who, like him, “proclaim liberty to the captives” (Lk. 2:18). Who are the captives? First and foremost, they are people enslaved by sin (Jn. 8:31-38, Rom. 6:15-23). But they’re also people enslaved by systems, including race-based prejudicial ones. For Christ died to break down “the dividing wall of hostility”—not only between us and God, but also between the races (Eph. 2:11-22). When we work toward racial reconciliation, then, we are eschatological signposts “on earth as it is in heaven” of the coming kingdom (Matt. 6:10). Ed Copeland is a TGC Council Member, former criminal defense attorney, and pastor of New Zion Missionary Baptist Church in Rockford, Illinois. Ed is an independent consultant for the Bureau of Justice and for MSU’s College of Criminal Justice. Alongside David Kennedy, Ed sits on the U.S. Department of Justice’s National Initiative for Building Community Trust and Justice. David Kennedy is a criminologist, professor, and author, whose award-winning work focuses on reducing violence, minimizing arrest and incarceration, and strengthening relationships between law enforcement and distressed communities. He is the director of the National Network for Safe Communities at John Jay College in New York City. His latest book, Don’t Shoot: One Man, a Street Fellowship, and the End of Violence in Inner-City America, features the work of two other panelists, Ed Copeland and Robert Lang. Robert Lang is the assistant U.S. attorney for the Middle District of North Carolina, where he has been a prosecutor since 1997. He also serves as the office’s Project Safe Neighborhoods, Anti-Gang and Reentry coordinator. Alex Medina is a music producer and art director at Reach Records. Alex emerged as a leading voice on social media in the wake of the events in Ferguson and New York. Cecil Smith is the chief of police for the Sanford Police Department in Florida, a position for which he was selected in the wake of the Trayvon Martin and George Zimmerman incident. 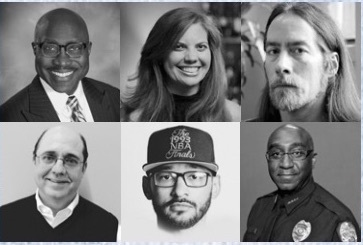 Not everyone on the panel is an ally—that is, a born-again Christian with whom we can go “a long way down the road.” All, though, are co-belligerents—that is, people committed to promoting justice in our neighborhoods, building trust between law enforcement and our communities, and finding a place for local churches to play a role in racial reconciliation efforts. In Orlando, we hope to come together for a lively conversation about how local church leaders can best engage their communities for the common good and human flourishing when it comes to justice, mercy, and racial reconciliation. There are, of course, no easy answers, but we hope you’ll join us as we stretch our imaginations about what might be possible when we come alongside our neighbors. You can also watch the panel at live.tgc.org.